Irrigated acreage, when combined with the crop water needs, form the basis for the system water requirement. Thus, accurate field measurements properly size the center pivot and also help determine the volume of water to be pumped. – Determine the precise field dimensions and draw a scaled field map. Label all dimensions. – Generally, the pivot is located to provide the largest possible center pivot system. Note: Allow at least 5′ end gun clearance from obstructions. 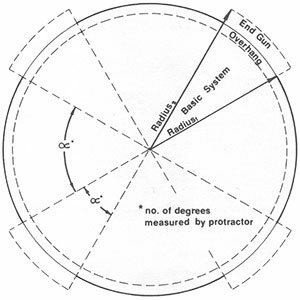 – Locate Pivot and draw circles of radius equal to system length (including overhang) and effective end gun coverage. Note: Maintain 30′ clearance between end gun and any roadway, and 50′ clearance from any high voltage power lines. – With a corner system, the pivot is located to allow the largest possible basic center pivot and to allow corner arm extension to the maximum acres beyond the reach of the basic system. Note: The last tower on the basic system of a corner system should miss all obstructions by 30-35 feet. – Segment the irrigated area into parts of a circle and into triangles and label dimensions. Compute the area of each segment, the sum the areas for the total acreage. To calculate the acreage included in a very irregularly shaped area irrgated by a corner system, draw a straight line or a circular arc that will most nearly provide and “average” boundary. The Dot Method can be very useful when calculating areas of non-circular or non-square fields. By simply counting the dots inside the field boundaries, and multiplying by a conversion factor, the acreage is determined. Note, however, that the field or aerial photo must be to a known scale. The Dot Method overlay is contained in the inner back cover. Draw the field and irrigated area to scale or obtain an aerial photograph and draw the system coverage on the photo. A scale of one inch = 660 feet is common with aerial photos and has a conversion factor of 0.156 acres/dot. On drawings of one inch = 330 feet, the conversion factor is 0.0391 acres/dot. Lay the overlay over the map and insure that it does not shift during the counting process. When dots fall on the area boundary, count every other dot. Note the small squares contain four dots and major squares contain 64 dots; the counting of squares can greatly speed up the computation. After all dots are counted, multiply this sum by the conversion factor to obtain acres.